Blech. This post is super late. Argh. A couple years ago there was quite the furor over a certain series of graphic novels (they were really in manga style than anything else, but let’s not split hairs). Those comics were then turned into a movie starring then-rising-star Michael Cera, and also starring a bunch of kind of random people. It had weird effects, story tropes borrowed from videogames, a surrealist take on story and development, and cost a boatload of money. That movie was Scott Pilgrim Versus the World, and it tanked. Let’s talk about why. Like a lot of nerds, I really loved this movie. Love this movie. 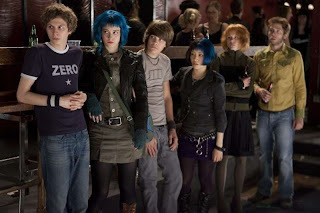 Sorry, it’s hard to think about Scott Pilgrim in the present tense. But I really do love it. I even own the official soundtrack, which is a crazy level of commitment for me. This doesn’t mean, obviously, that I love it unreservedly. There are a lot of things I find objectionable here, and let’s not even get into how I feel about Ramona’s status as a prize to be won. It makes me angry. 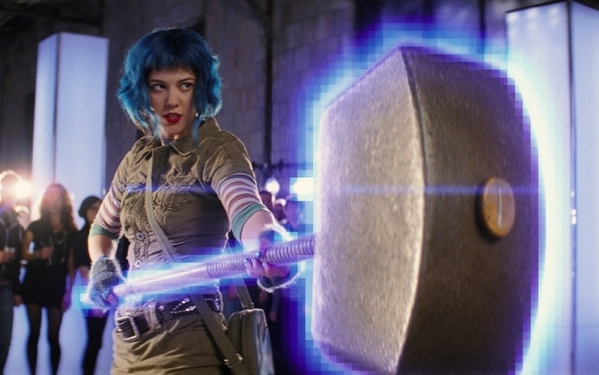 Combining the best parts of comics, old school videogames, and experimental filmmaking, Scott Pilgrim really does feel like a loveletter to geek culture. The main character, Scott, is an unrepentant man-child who plays in a terrible band, loves videogames, and sponges off of his roommate. The girl, Ramona, is a total manic pixie dream girl, who is daring because she used to live in New York, likes obscure bands, and has really epic hair. Everyone talks in pithy witticisms, the laws of physics don’t apply, and people explode into little clouds of coins when you beat them. If you don’t already know, the plot is pretty simple, but very odd. Scott Pilgrim is a womanizing loser who falls for the unattainably awesome Ramona. She’s cool with dating him (for some reason), but before they can get together, he has to defeat her seven evil ex-boyfriends. So he does. And it’s a funny heartwarming story where a guy finds something to believe strongly in, even if it’s just the power of love. Now, aside from this being a really weird plot for a movie to actually have, I think we need to look at why it didn’t work going into the mainstream. Because, strange as the film sounds, it is really fun and a cute little story. There’s a great throughline about how Ramona isn’t comfortable with her past, and the idea that Scott’s done some pretty terrible things himself aren’t bad either. There’s even a passing explanation that Scott could be on his way to being just another evil ex of hers, and the idea that he’s piled up a few evil exes of his own. That, plus the general metaphor of the film, which is that you can’t let someone’s past get in between you and having a relationship with them. The past is the past and you move forward together. I like all of that. 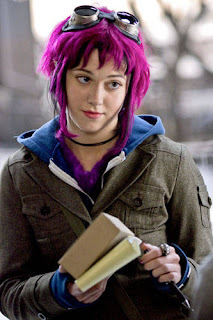 Plus, Ramona’s pretty freaking cool, even if she is marginalized towards the end. And Young Neil is awesome. All of the themes I mentioned are pretty standard story themes. Sure, they’re not the obvious choices, but they aren’t exactly off the wall. So what was so hard to relate to about this film? To start it off, they failed with the advertising. The first movie poster they released was a shot of Michael Cera with a guitar and some funky lettering. It was bad. At the time I didn’t know that this was based on a comic, and I was so sick of Michael Cera being in everything and always playing the exact same character, that I was about ready to puke. I was very unsold, and I think a lot of other people were too. And, really, that movie poster didn’t tell you anything about the movie. Michael Cera, despite that weird couple of years where they tried to push him at us, isn’t really the kind of star that opens movies with just his name. We still want to know what the hell the movie’s about. When they finally told us, well, it was still going to take some doing. The plot is convoluted and weird. Yes, it’s based on a graphic novel, and that makes it make more sense, but the actual plot – Scott fights a bunch of random guys so that he can date this girl – doesn’t really make sense when you hold it up to a little scrutiny. Why? Why does he have to fight them? I mean, they do keep showing up and trying to hurt him and stuff, but I don’t get… It’s just a little confusing it what I’m saying. And the trailers and later posters didn’t really help with that. But the final, and probably biggest, reason it didn’t catch on with a large audience is that the style the film was created in is inherently limiting. Or, to put it a meaner way, most people just didn’t get it. It feels a little mean to say that, but it’s true. Most people just straight up did not get this movie. Was it trying to be a satire, or an action movie or a – what the hell was it trying to be? And that’s a valid question, when you come down to it. 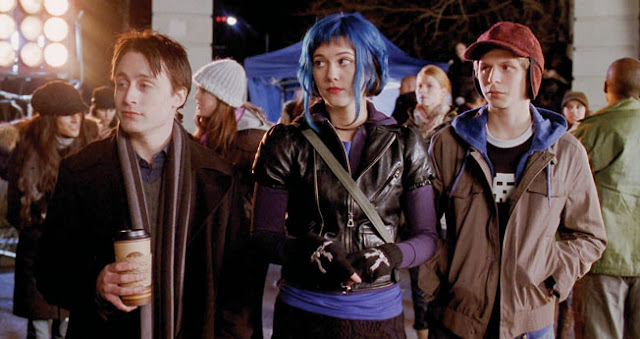 Scott Pilgrim mashed so many genres, and invented a few of its own, that it makes it really hard to figure out where this film goes. People didn’t get it. And that’s fine. No, really, it is. I don’t get French surrealist film. I think it’s stupid and boring. But that doesn’t mean that no one can get French surrealist film. I think it’s lovely that some people think it’s lovely. The same thing goes here. 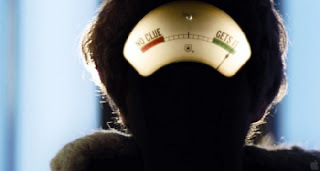 I think this film was brilliant, an imaginative masterpiece, that skillfully blended mediums and created a surrealist pastiche that really captures the feeling of being in your twenties, afraid to grow up, and even more afraid to commit to a real relationship and the responsibilities that brings. But I totally understand that some people can’t stand it. It doesn’t speak their language, and that’s okay. When it really boils down to it, I think this movie failed because it forgot that not everyone would get it. In reality, it’s pretty freaking rare that everyone gets any movie not made by Pixar. Most movies are specialized to an audience, and that’s fine. The problem comes when the studios and the audiences don’t recognize that. The studios get mad that they aren’t making enough money on their films, and the audiences get mad because they can’t relate to a story, and they’ve been told that they must always be able to relate. What happens is that we all start aiming for the lowest common denominator. We make things that are supposed to be accessible to everyone, and things like that just aren’t very interesting. And they’re definitely not good art. To make something really great, you have to admit that it might fail. As long as we keep reaching for the middle, we’re screwed. So. Studios: spend less money on your films and expect that they will appeal to a very specific audience. Audience: don’t get butthurt if you don’t understand the movie. Just go out and look for a movie that you do understand. I think this will make us all much happier. Wallace is one of the best parts of this movie.